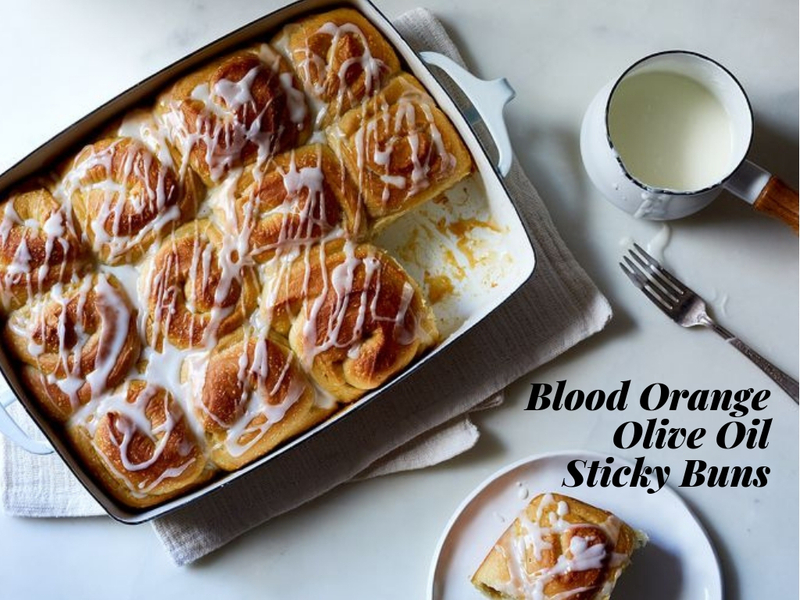 These Blood Orange Olive Oil Stick Buns are perfect for a winter morning and especially lovely on Christmas morning or New Year’s Day. You can make the rolls the day before and bake them in the morning. We adapted this recipe from Food 52. The original recipe uses a fruity olive oil which we’ve swapped for Blood Orange Olive Oil. but it’s also lovely with Arbequina EVOO or Meyer Lemon Olive Oil and fresh lemons. While the buns are baking, make the glaze by whisking the buttermilk into the confectioners’ sugar bit by bit until it is the consistency that is thick but pourable. When the buns are finished baking, spread the glaze on the warm buns. Serve warm, preferably with some espresso or strong coffee, and moist napkins for cleaning off your deliciously sticky fingers.